SI (sacroiliac) joint pain is a real pain in the......well low back and glutes. It can be absolutely debilitating if you've ever had it or think you might be suffering from it. The worst part about it all it that it is a multi-factorial problem in that it doesn't have just one cause. It can come from your pelvis shifting due to a mis-step or from chronic imbalance. 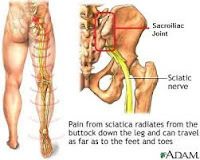 It can also result from tight erector muscles (the ones that run up your back) or even your glutes/piriformis locking down and pulling you out of balance. Here is a bunch of ideas to start working on to try and address this pain from as many angles as you can in hopes to get that pain to resolve. Kelly also touches on your movement and making sure that isn't continuing to add to the problem.